Well, we were 0 for 2 today! Our plan for the morning was to check out a flea/antique market near our apartment. We walked over that way, easily finding the market--lots of people! It was not the most interesting market---mostly old clothes and household items, so we just made a quick walk through and left. 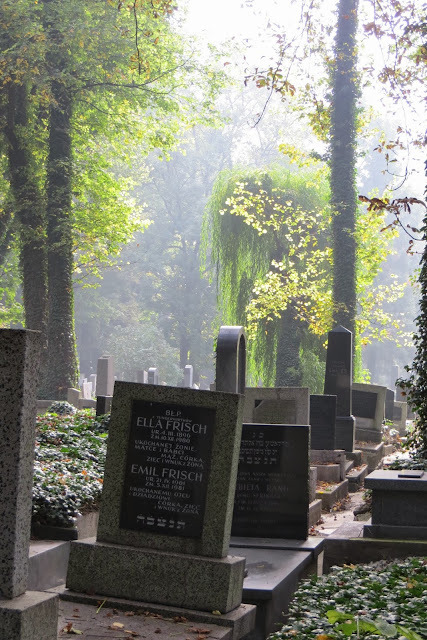 We walked a different route home, and found the "New" Jewish Cemetery, founded in 1800. During the Nazi invasion of Krakow the cemetery was closed. The headstones and slabs were used as construction material and to pave a road to the Plaszow concentration camp. The bones were left uncovered and scattered. The camp was restored soon after the war, many of the headstones were recovered from the camp site. I continue to be saddened, shocked and horrified by the inhumanity of the German Nazi's towards the Jews and Poles. It is an unfathomable disrespect of human life. We made our way back to our apartment, and spent a couple of hours packing and organizing. We have an early departure tomorrow--so we need to be ready to go! We walked into the main building, and we were the only ones there! It was about 1 pm, so we thought maybe we were a little early. We decided to order a sampler of their 5 beers, and look at a lunch menu. We weren't overly impressed with their beer, and nothing on the menu caught our eye. We talked about coming back later to catch the music, but couldn't find a schedule of events. We asked the young lady who served us what time the festival started, and she said ----tomorrow! Hmmmmmmm--I was pretty sure the sign said 9/29/2013. We walked out into the courtyard to look at the sign, and sure enough--it said 9/29. Something lost in translation, I guess! Like I said--our batting average is pretty dismal today! 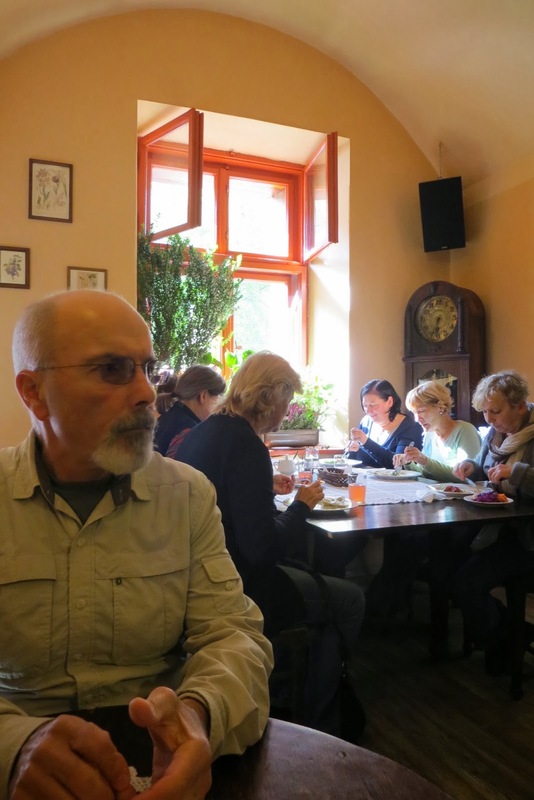 We strolled around a few block area looking for a likely lunch spot, and chose a small restaurant on a side street. It was quite charming and very busy with locals out for Sunday lunch! We shared a small sandwich and an order of spinach and goat cheese pierogis--which were delicious. We also tried these little goodies--prunes wrapped in bacon, with dill sauce. Mmmmmmm, good! After our yummy lunch, we walked toward the river and across a pedestrian bridge. Interesting new building under construction. Love how they are saving the old buildings! We didn't see anything of much interest on the other side of the river, so we walked back towards our apartment, stopping along the way for a mug of mulled wine--it's pretty chilly today. We stopped to visit the Remuh Cemetery ("Old" Jewish Cemetery), which is located right across the square from our apartment. As we walked in the the small courtyard entrance, we noticed several memorial plaques on the walls. This one caught my attention--88 members of one family lost in the Holocaust. 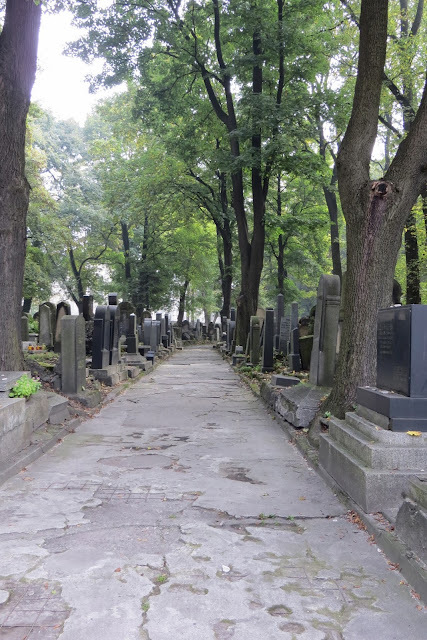 The Remuh Cemetery was established in 1535, and used until 1800, when the "New" Jewish Cemetery was opened. 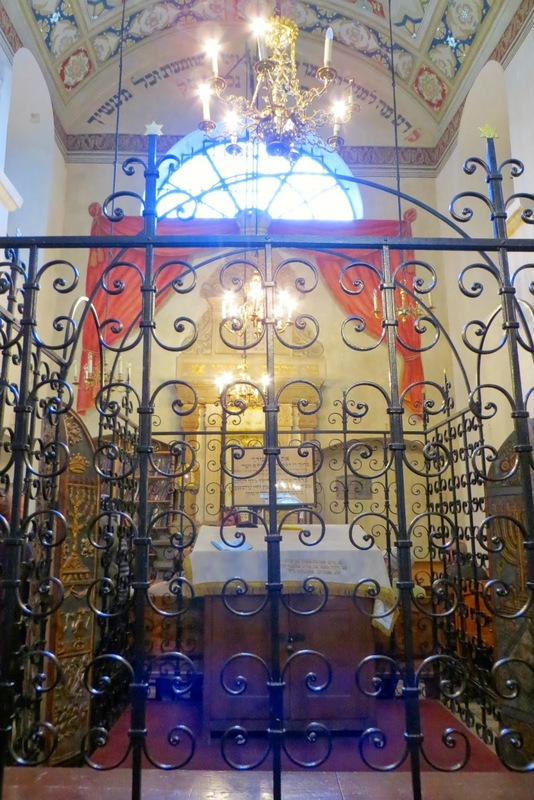 The Remuh Cemetery is next to The Remuh Synagogue, founded around the same time as the cemetery. It was rebuilt in the 1800's, and the interior was looted and all but destroyed by the Nazis. It was restored to it's present form in 1957. The very tiny Remuh Synagogue is the only active synagogue in Krakow today. After our time at the Remuh Synagogue and Cemetery, we relaxed a bit until dinner time. 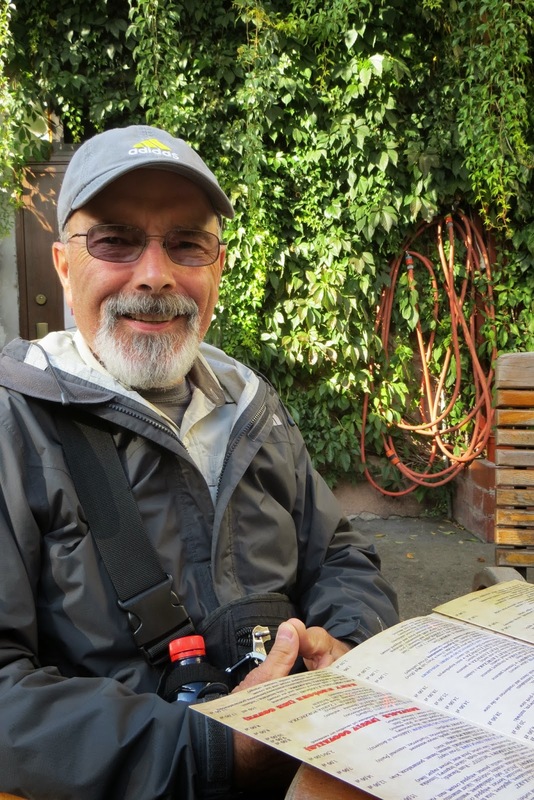 As we are most definitely tired of Polish, Czech and German food, we decided we'd like to return to our favorite restaurant right in our neighborhood, Portofino. We had a lovely meal, each choosing a different pasta dish, and they were both delicious. Of course, we finished our evening with one last mulled wine! We said goodbye to our favorite waitress, and enjoyed one last evening stroll through those pretty narrow streets back to our apartment. Goodnight from Krakow, one of my favorite places ever! Tomorrow: We have an 8:00 am train to Warsaw, about a 3 hour trip from Krakow.